Clinically, it appears as a two separate crowns joining together or a crown of bigger than normal. The union may occur all along the long axis of the tooth or the roots only, in such a case cementum and dentin are shared. Root canals may also be separated or shared, which may lead to a reduced number of teeth or may occur between a normal and a supernumerary tooth. , The presence of deep fissure in fused teeth predisposes them to dental caries and periodontal diseases. Different treatment choices can be implied according to the requirements of the situation. The best treatment plan depends on the nature of the anomaly, the morphology of the pulp chamber, the subgingival extent of the separation line, and the patient compliance. The purpose of this report is to present a rare case of a fused mandibular lateral incisor with supernumerary tooth by a multidisciplinary approach involving endodontic and restorative treatment, in which the complex was successfully treated with nonsurgical endodontic therapy. A 35-year-old female patient with an extraoral sinus tract in the chin was referred to our clinic. Clinical examination revealed also intaroral sinus tract in the mandibular anterior region and anomalous shape of a tooth resulting esthetic and functional problem regarding her mandibular right central incisor. There was no significant medical history and no family history of dental anomalies. Her parents had no hereditary diseases, and her mother did not use any medication and was not exposed to radiation or trauma during pregnancy. The mandibular right lateral incisor was anomalous, with a mesiodistal width of 7.5 mm and an evident buccal and palatal groove dividing the crown into mesial and distal segments. All the other teeth were in normal size and shape. While radiographic and clinically examinations, a supplemental tooth between the mandibular right central and lateral incisor was detected. The diagnosis was fusion, caused by union of the lateral and a supernumerary tooth. Radiographic examination [Figure 1] showed that the mandibular right lateral incisor had two separate roots and pulp canals. Pulp vitality tests were negative, during clinical control, intra [Figure 2] and extra [Figure 3] oral sinus tract was revealed; also with a wide periapical radiolucency at the apex of the tooth [Figure 1]. The lingual view of teeth is presented in [Figure 4]. The teeth were accessed using round bur under rubber dam isolation. The pulp chamber was then irrigated with 2.5% sodium hypochlorite. Working length was determined using an electronic apex locator (Raypex 6, VDW, Germany) and confirmed with periapical radiograph. The root canals were shaped with ProTaper (Dentsply, Maillefer; Switzerland) rotary instruments. Then calcium hydroxide paste (Sultan Chemists Inc. Englewood, NJ, USA) was used as intracanal medicament, and the access was sealed with temporary filling material (Cavit, ESPE, Seefeld, Germany). After 2 weeks, the teeth were asymptomatic, and the extraoral and intraoral sinus tract mark was showing slight improvement. 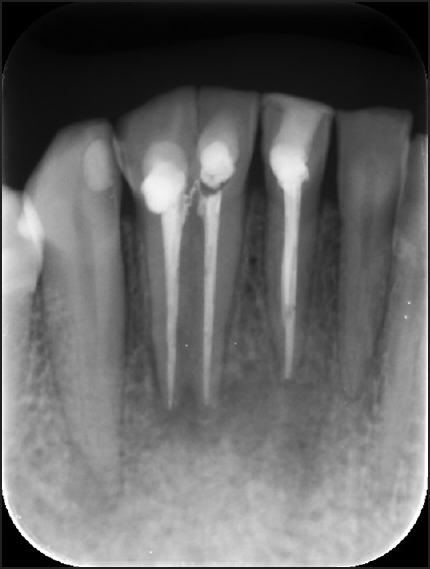 Then, the root canals were obturated with gutta-percha and an epoxy-amin resin-based canal sealer (AH Plus, Dentsply DeTrey GmbH, Konstanz, Germany) using lateral condensation technique. A postoperative final radiograph was taken [Figure 5]. 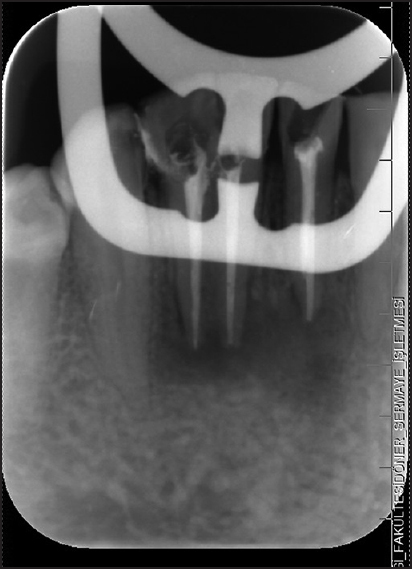 Figure 1: Preoperative radiograph of fused mandibular lateral incisor with supernumerary tooth. Figure 2: Initial intraoral appearance of fused mandibular lateral incisor with supernumerary tooth. Figure 3: Appearance of initial status of extraoral fistule originating from fused teeth. Figure 4: Lingual appearance of fused mandibular lateral incisor with supernumerary tooth. 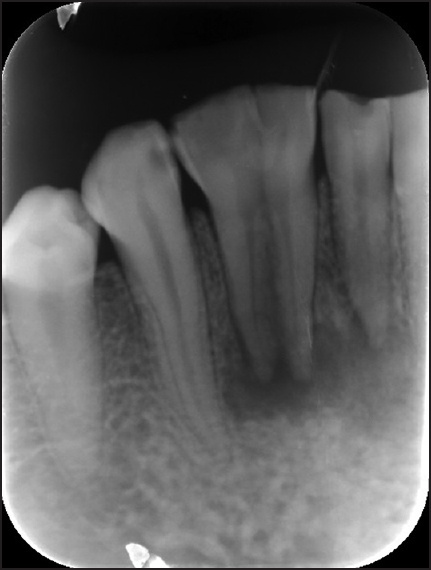 Figure 5: Appearance of fused teeth radiographically immediately after root canal treatment. Following the root canal treatment, the tooth was restored with a two-step self-etch adhesive system (Clearfil SE Bond, Kuraray, Japan) and microhybrid composite material (Clearfil Majesty Esthetic, A2 shade, Kuraray, Japan). Polymerization procedures for both adhesive material and resin composite were performed using the light-emitting diode curing light (Elipar S10, 1200 mW/cm 2 , 3M ESPE, St. Paul, MN, USA). The composite restoration was finished with a fine-grit finishing diamond burs (Diatech Dental AG, Heerbrugg, Switzerland), than polished with discs (Sof-Lex 3M ESPE, St. Paul, MN, USA). All application procedures and curing times were performed according to the manufacturers' instructions. The patient was recalled at 6-month, 12-month and 18-month after endodontic and restorative treatment. During recalls, the clinical appearance of the skin had returned to a healthy status [Figure 6]. 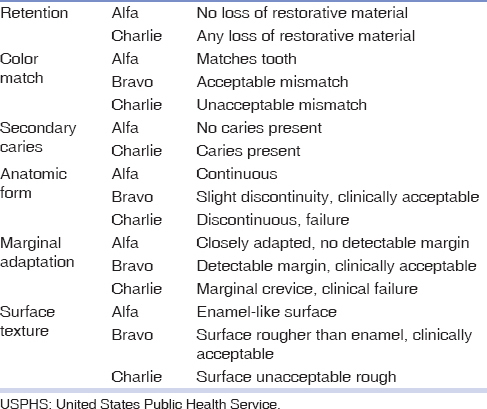 The composite restoration was examined to determine clinical acceptability according to the criteria of the United States Public Health Service (USPHS) [Table 1] in terms of retention, color match, secondary caries, anatomic form, marginal adaptation, and surface texture [Figure 7]. Radiographic examination revealed the periapical lesions had resolved significantly [Figure 8]. 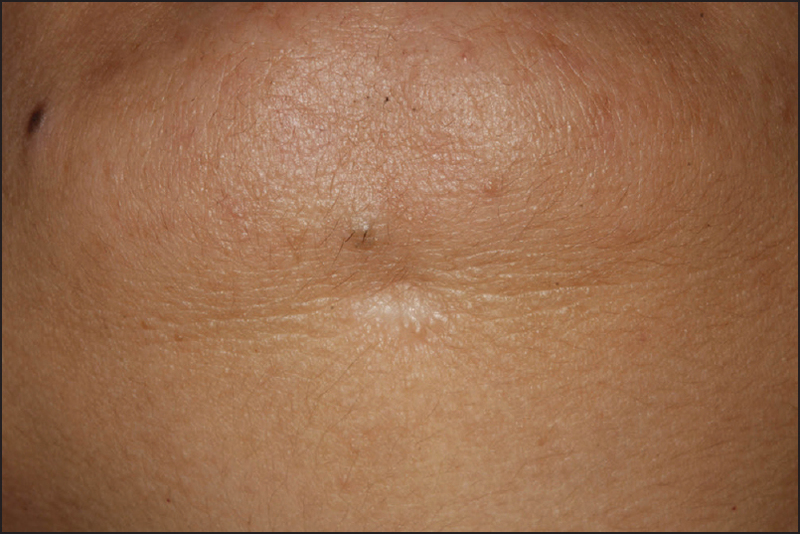 Figure 6: Healed extraoral fistule after 18-month. 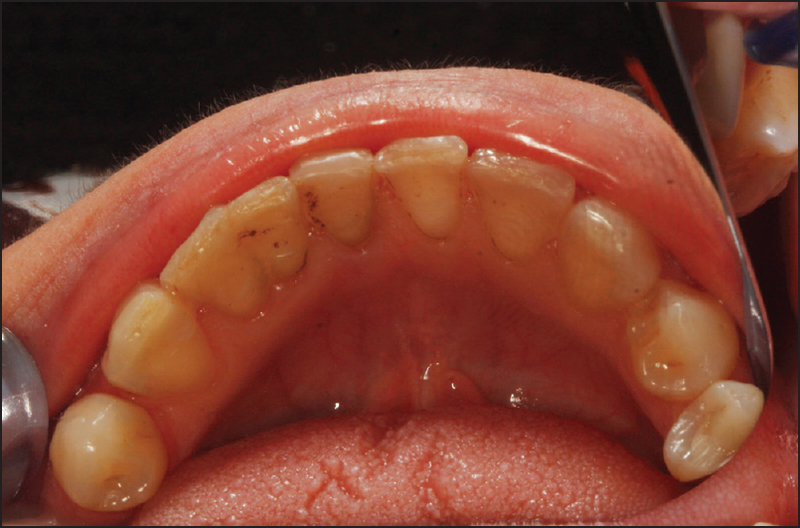 Figure 7: Clinically appearance of fused teeth after 18-month. Figure 8: Appearance of fused teeth radiographically 18-month after root canal treatment. Periapical lesions develop as sequelae to pulp disease. They often occur without any episode of acute pain and are discovered on routine radiographic examination. Bacterial infection of dental pulp may lead to periapical lesions. They are generally diagnosed either during routine dental radiographic examination or following acute pain in a tooth. The formation of periapical lesions is not fully understood, though is accepted that pulp necrosis produces an ideal environment for the growth of microorganisms which in turn release toxins into the periapical tissues, inducing an inflammatory reaction and thus the formation of a periapical lesion. Dental trauma is one of the factors which is associated with disruption of blood supply to the pulp which is responsible for the occurrence of pulpal necrosis later developing into periapical lesions. Treatment options of periapical lesions include nonsurgical root canal treatment, apical surgery, or extraction. Initially, nonsurgical root canal treatment is attempted to control large periapical lesions. Endodontic treatment should be performed when the pulp systems of both teeth are connected in a common pulp chamber or when communication exists between the two root canals. In the present case, despite the presence of two separate pulp chambers and root canals, endodontic treatment was mandatory because of teeth necrosis of an unknown etiology. In this case, the recalls were performed at the end of 6-month, 12-month and 18-month. After 18-month from the treatment, the healing was observed on the fused lateral and central teeth in terms of the periapical lesion. 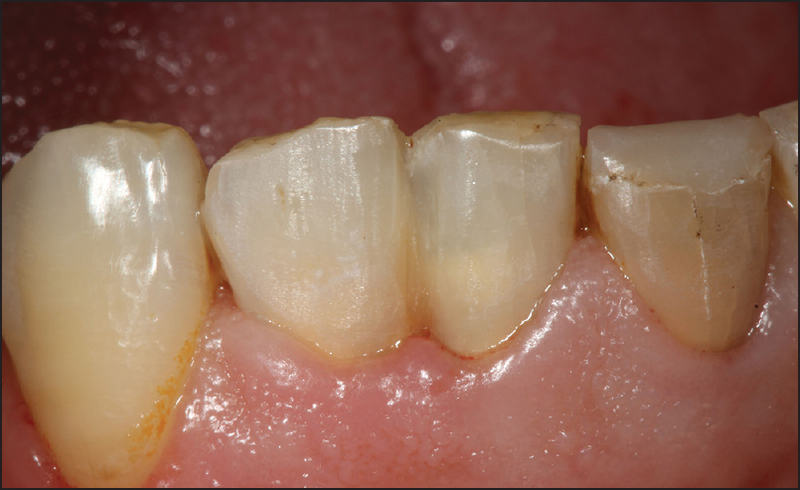 Atasu and Cimilli  reported a case in which hypersensitivity and tenderness to percussion in a caries-free fused tooth necessitated endodontic therapy. Various treatment considerations have been recommended to achieve ideal esthetics and occlusion, which usually require a multidisciplinary approach. In several cases, the treatment includes sectioning off the teeth. ,,,, Different from them, in this case, there were enough places for the supplementary tooth on the dental arch. Hence, surgical choices were not conceived, thinking that the teeth taking place in the lower jaw and not threat of esthetic appearance of the patient. Furthermore, considering the age and expectations of the patient, a more conservative approach was preferred. During 18-month follow-up, the clinical appearance of the skin had returned to a healthy status. The composite restoration was found successful according to the criteria of USPHS in terms of retention, color match, secondary caries, anatomic form, marginal adaptation and surface texture. The composite restoration was scored as alpha for all USPHS criteria at three recalls. The follow-up demonstrated a clinically asymptomatic and adequately functional tooth. This case report presents a rare case of a fused mandibular lateral incisor with the supernumerary tooth. Fused teeth can be successfully managed by comprehensive treatment protocols which include endodontic and restorative treatment. Nunes E, de Moraes IG, de Novaes PM, de Sousa SM. Bilateral fusion of mandibular second molars with supernumerary teeth: Case report. Braz Dent J 2002;13:137-41. Shafer WG, Hine MK, Levy BM. Shafer′s Textbook of Pathology. 1 st ed. Philadelphia: WB Saunders Company; 1983. p. 38-9. American Association of Endodontists. Glossary of Endodontic Terms. 8 th ed. Chicago: American Association of Endodontists; 2012. Steinbock N, Wigler R, Kaufman AY, Lin S, Abu-El Naaj I, Aizenbud D. Fusion of central incisors with supernumerary teeth: A 10-year follow-up of multidisciplinary treatment. J Endod 2014;40:1020-4. Kim SY, Choi SC, Chung YJ. Management of the fused permanent upper lateral incisor: A case report. Oral Surg Oral Med Oral Pathol Oral Radiol Endod 2011;111:649-52. Aguiló L, Gandia JL, Cibrian R, Catala M. Primary double teeth. A retrospective clinical study of their morphological characteristics and associated anomalies. Int J Paediatr Dent 1999;9:175-83. Gautam G, Kumari VS, Jayashankar CM, Hadge P, Garg G. Interdisciplinary management of dental anomalies: Fusion and supernumerary teeth. Orthodontics (Chic) 2011;12:140-7. Foster KH, Primack PD, Kulild JC. Odontogenic cutaneous sinus tract. J Endod 1992;18:304-6. Möller AJ, Fabricius L, Dahlén G, Ohman AE, Heyden G. Influence on periapical tissues of indigenous oral bacteria and necrotic pulp tissue in monkeys. Scand J Dent Res 1981;89: 475-84. 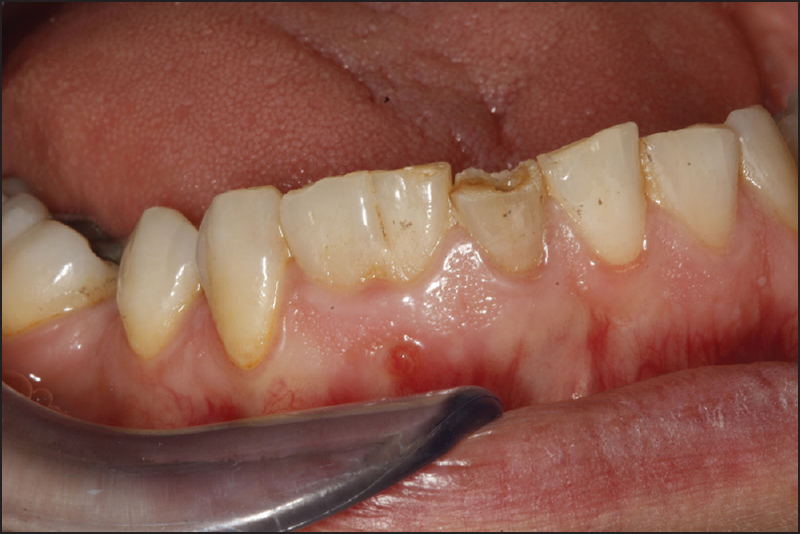 Saatchi M. Healing of large periapical lesion: A non-surgical endodontic treatment approach. Aust Endod J 2007;33:136-40. Atasu M, Cimilli H. Fusion of the permanent maxillary right incisor to a supernumerary tooth in association with a gemination of permanent maxillary left central incisor: A dental, genetic and dermatoglyphic study. J Clin Pediatr Dent 2000;24:329-33. Karaçay S, Gurton U. Multidisciplinary treatment of "twinned" permanent teeth: Two case reports. J Dent Child (Chic) 2004; 71:80-6. Sammartino G, Cerone V, Gasparro R, Riccitiello F, Trosino O. Multidisciplinary approach to fused maxillary central incisors: A case report. J Med Case Rep 2014;8:398. Cetinbas T, Halil S, Akcam MO, Sari S, Cetiner S. Hemisection of a fused tooth. Oral Surg Oral Med Oral Pathol Oral Radiol Endod 2007;104:e120-4.